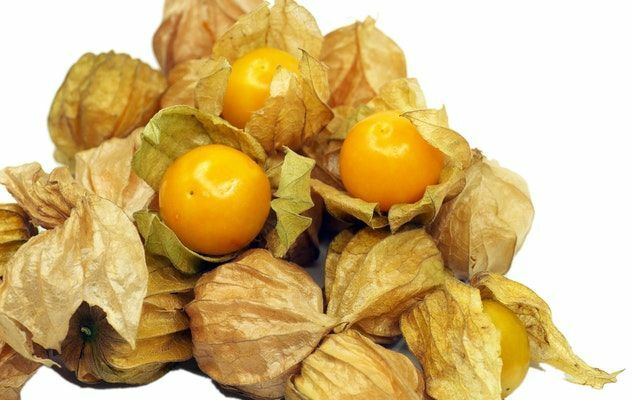 From mid-August up to the first frost, small, beige-coloured ‘Chinese lanterns’ that contain orangish-yellow berries become available in our markets: These small fruits are called ‘groundcherries’, although they are neither cherries nor gooseberries. They belong in fact to the tomato family and also go by such names as cape gooseberry, alkekengi, love-in-a-cage, etc. There are around a hundred varieties of the plant genus Physalis that are found across all the tropical, sub-tropical and temperate regions in the world. Their fruits have never made much of an impact in the diet of the different people who eat them, partly because they have to be picked manually. The taste can vary from one variety to another. The ones that are grown in Canada are sweet, with a tart and astringent after taste. Make sure that you only eat the fully ripe fruits that are golden yellow in colour. They can be kept for several weeks in the refrigerator as long as they remain in their husk. Groundcherries, like all other berries are rich in antioxidants. They are suitable for making compotes, jellies and jams. And they taste simply delicious in a chocolate fondue. Put all the ingredients in a pot, bring to a boil. Keep in the fridge for a few days or in the freezer. Originally published in the Journal de Montréal on September 17, 2011.